Entries tagged with "Notary Signing Agent"
Newton MA area residents and businesses can rely on Neighborhood Parcel’s Mobile Notary service to conduct notary services at their Homes, Offices, Hospitals or Assisted Living places. Our knowledgeable and prompt Notary Signing Agent will arrive on time as promised and help you with your signatures witness notaries service needs. We operate 7 days a week including after-hours appointments, subject to availability of course. We have been serving the Newton MA area for over a decade and we will be happy to serve you. Neighborhood Parcel has a reliable and affordable Mobile Notary service that is available to you 7 days a week and after hours. You will find our staff to be flexible, accommodating and very knowledgeable. Once you book your next Mobile Notary through our website or simply by calling (978)851-0199, you will notice the difference! We love to help in last minute situations: Nursing homes, Last Will and Testaments, Divorces, Mortgage Documents, Retirement Documents or any Signature Witness task requiring the presence of a Notary Public. 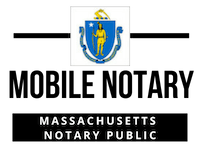 Mobile Notary Public Boston, Tewksbury, Woburn, Wilmington, Andover MA. Fast, dependable Mobile Notary Signing agent service seven days a week and after Hours. Notary Service from $49.95 Signature Witness, Copy Certification, Oath and Last Will Testament Signatures. Neighborhood Parcel Mobile Notaries are National Notary Association (NNA) Certified Notary Signing Agent. We proudly serve the Merrimack Valley, Boston MA, Essex and Middlesex Counties in Massachusetts.